Kevin Doran’s #77 Doran JE4 Ford will be driven by Terry Borcheller and Harrison Brix in the 2006 Rolex Series, with sponsorship from Kodak Easyshare. The regular pair will be joined by Forest Barber and Michel Jourdain for the Rolex 24. The full name for the entry will be the Feeds the Need / Doran Racing Kodak EasyShare Doran JE4 Ford, with additional sponsorship from SIRIUS Satellite Radio. 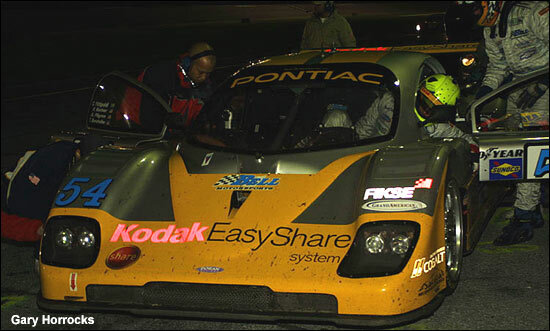 Borcheller and Barber shared the first DP win at the Rolex 24, in Forest Barber’s Doran, in 2004, and Borcheller was the maiden 2003 DP Champion, in the same car, in 2003. Barber will also drive the #77 Doran at Watkins Glen in June and Miller Motorsports Park in September. Terry Borcheller sounds as though he’ll be as busy as ever in 2006: he and Forest Barber will be racing in the 2006 Grand Am Cup GS class, in the #2 Ford Mustang, entered by Blackforest Motorsports. "The success of the Rolex Series has made the competition tougher than it's ever been," commented Kevin Doran. "We're constantly developing the Doran JE4, and I'm confident that we have a strong package. Harrison will learn from Terry Borcheller and Forest will help us in many different ways. We're glad that Michel is doing his first Rolex 24 with us. He'll generate even more interest in our team." Here are Christian Fittipaldi and Terry Borcheller at a driver change during the victorious 2004 Rolex 24.